Initially trained as a botanist and ecologist, Em’kal Eyongakpa is an intermedia artist who works with photography, video, sculpture, sound and text. Initially trained as a botanist and ecologist, Em’kal Eyongakpa is an intermedia artist who works with photography, video, sculpture, sound and text. 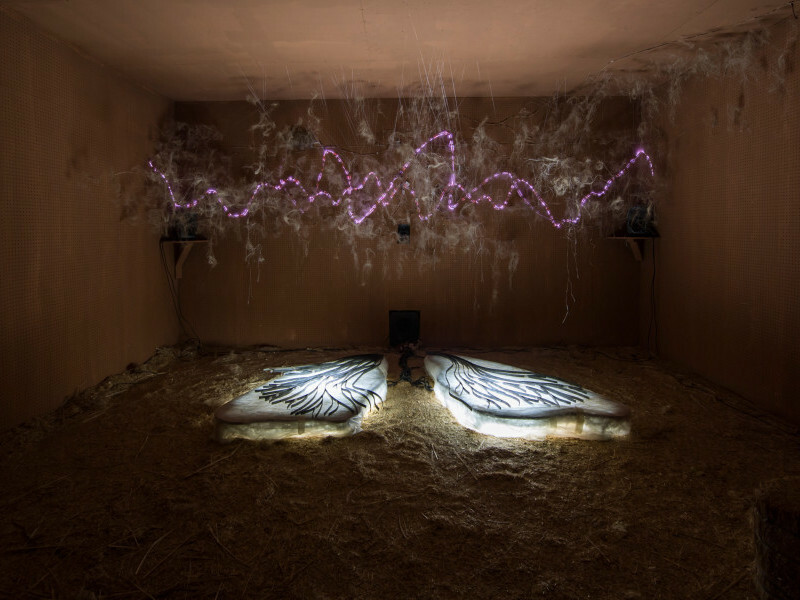 Central to his practice is the quest for negotiations between ‘life’ sciences, art, 'juju’ and technology, with interwoven installations, performances and soundscapes that not only blur the boundaries between the media he employs but also alter perceptions of the real and the imagined. He approaches ideas of the experienced, the unknown and the collective through the ritual use of repetition and transformation. Eyongakpa’s solo exhibitions include beats/bits of(f) sPACE(s), APalazzo Gallery, Brescia, Italy (2016); negotiations – Chapter 1-i: Dualaland – Paris, KADIST, Paris (2015) and (dis)placement, Institut français du Cameroun, Yaoundé. His work has also been shown in group exhibitions such as Sharjah Biennial 13: Tamawuj (2017); Le Grand Balcon, La Biennale de Montréal (2016); Incerteza Viva, 32nd São Paulo Biennial (2016); The Incantation of the Disquieting Muse, SAVVY Contemporary and Goethe Institute South Africa, Berlin (2016); Le Cyclop de Jean Tinguely, Milly-la-Forêt, France (2016) and All Of Us Have A Sense Of Rhythm, Curators’ Series # 8, David Roberts Art Foundation, London (2015). He received Le prix de la Ville de Dakar, Dak’art (2012) and was longlisted for the AIMIA | AGO Photography Prize, Toronto (2013). He was a resident artist at KADIST, Paris (2015); Rijksakademie van beeldende kunsten, Amsterdam (2014) and Bag Factory, Johannesburg (2011). In 2007, Eyongakpa started the artist-run autonomous art hub KHaL!SHRINE in Yaoundé, Cameroon. He received a Master of Science in Botany and Ecology from the University of Yaoundé 1, Cameroon (2005) before beginning his work as an artist. Born in 1981 in Mamfe, KƐnyaŋland/DƐnyaland, he currently describes himself as itinerant. Central to Em’kal Eyongakpa’s practice is the quest for negotiations between ‘life’ sciences, art, 'juju’ and technology, with interwoven installations, performances and soundscapes that not only blur the boundaries between employed media but could also alter notions of the real and the illusory.